Twelve thousand centuries ago, long before the first humans appeared in what would someday be northern New Mexico, the stillness was shattered by a series of explosions dwarfing anything ever witnessed by modern man. A giant chamber filled with molten rock had long been growing deep underground, and when this finally exploded to the surface, the results were catastrophic. An incandescent mixture of volcanic ash and gas poured across the earth and covered the ground for miles in every direction. Finer ash was deposited up to 500 kilometers (300 miles) downwind, and the smallest particles were lofted into the stratosphere, dimming the sun for months. The roof of the emptied chamber collapsed to produced a volcanic crater, or caldera, 19 km (12 miles) across and 1000 m (3500') deep. 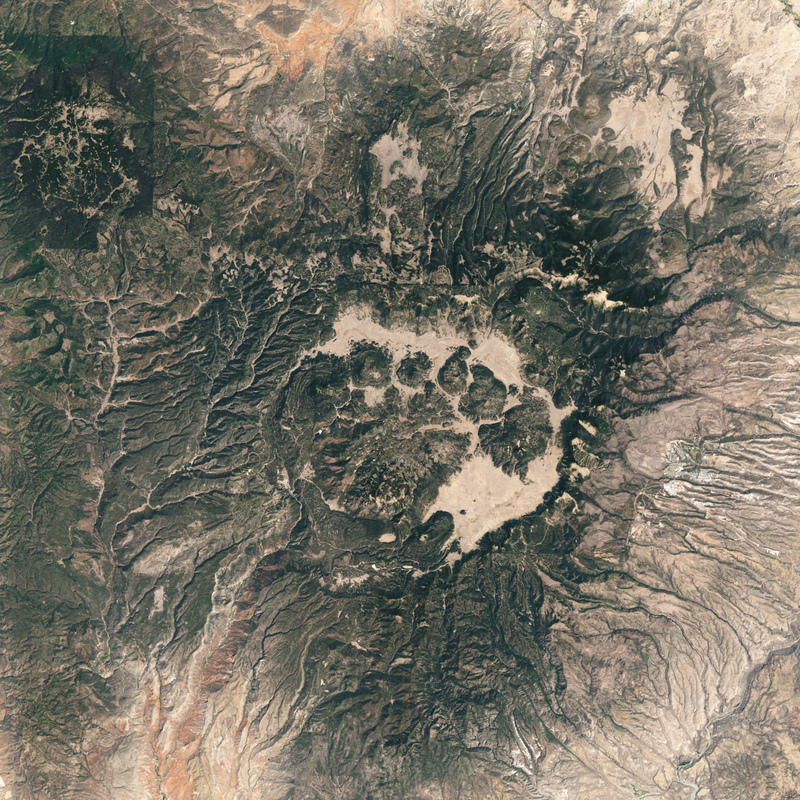 The caldera can still be seen on satellite photographs today. 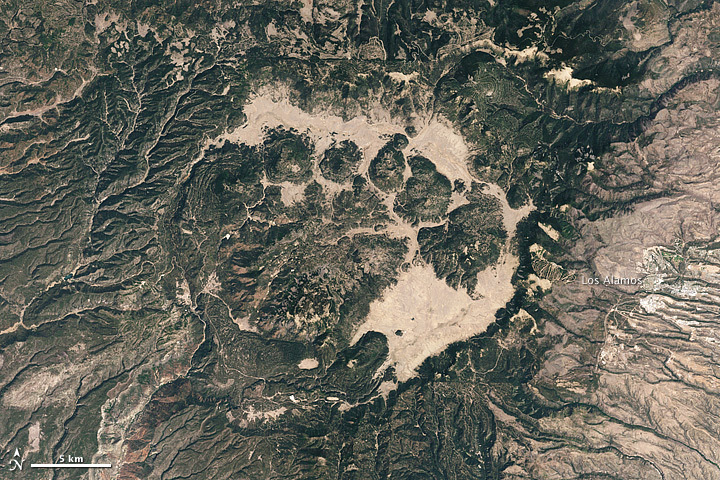 Remnants of the thick layers of volcanic ash deposited by the eruption form the characteristic finger mesas of the Los Alamos area. But the eruption that occurred 1.2 million years ago was not the first in the Jemez area. A similar eruption had taken place 400,000 years earlier, and there have been smaller eruptions in the area for at least the last 14 million years. The last of these smaller eruptions took place about 74,000 years ago. Further eruptions are almost certain to take place, though there are no indications that we are likely to see such an eruption in our lifetime. This long history of eruptions has made the Jemez a choice location for studying the geologic processes involved in volcanic activity. The geologic wonders of the Jemez are not limited to its volcanic history. The Jemez Mountains sit on the boundary between the Colorado Plateau and the Rio Grande Rift, two great tectonic provinces of the earth's crust. The Colorado Plateau is a block of stable crust that has been slowly subsiding for most of the last billion years, and it has accumulated thick beds of sedimentary rock that record this long geologic history. The Rio Grande Rift is a great tear in the Earth's crust where the Colorado Plateau has pulled away from the interior of the continent. Here the eastern margin of the Colorado Plateau has been thrust upwards, deeply eroded, and its geologic record exposed to view. In the pages that follow, I will tell the story of the Jemez Mountains, from the assembly of northern New Mexico 1.8 billion years ago through the ages to the present. You will see photographs of some of the rock outcroppings that have allowed geologists to piece together this story. 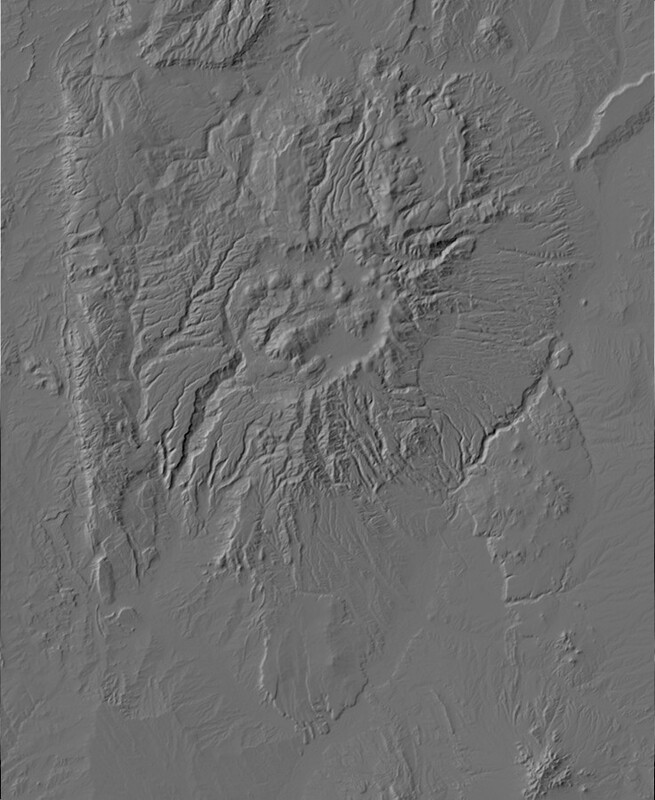 I will provide relief maps showing important locations, generated from NASA terrain elevation data with locations of roads and cities from the OpenStreetMap database. Geographical coordinates are provided for the adventurous reader who wishes to visit these locations using a GPS navigator. The geographical coordinates are also linked to Google Maps, as a further aid to navigation and understanding. I have written these pages for readers who have an interest in science, but are not necessarily geologists. Because I am writing for a scientifically-minded international audience, I use metric units, but I also include English units for the benefit of the American reader. A note regarding photographs: Most of the images in this book can be clicked with your mouse or other pointer device to get a full-resolution version. Use the back arrow of your browser to return to the book. Many images also have legends, which will appear superimposed on the image when you hover the mouse arrow over the image. It may take a few seconds for the legend to load. Unless indicated, all images are © Kent G. Budge. All rights reserved. The Jemez Mountains are located in northern New Mexico, some 90 km (55 miles) north of Albuquerque and 55 km (35 miles) west-northwest of Santa Fe. The largest city in the Jemez area is Los Alamos, located on the Pajarito Plateau that extends east of the mountains. Other population centers in the Jemez area, starting southeast of Los Alamos and working clockwise, include White Rock, Cochiti, Jemez Springs, Cuba, Coyote, Abiquiu, and Espanola. There are no large population centers in the heart of the range, most of which is either National Forest land, part of the Valles Caldera National Preserve, or part of Bandelier National Monument or Kashe-Katuwe Tent Rocks National Monument. Much of the land that does not belong to the federal government belongs to Native American tribes, and most tribal lands are not open to the public. The Jemez Mountains are best known to geologists for the Valles Caldera, the depression in the Earth's crust formed by the catastrophic eruptions 1.2 and 1.6 million years ago. 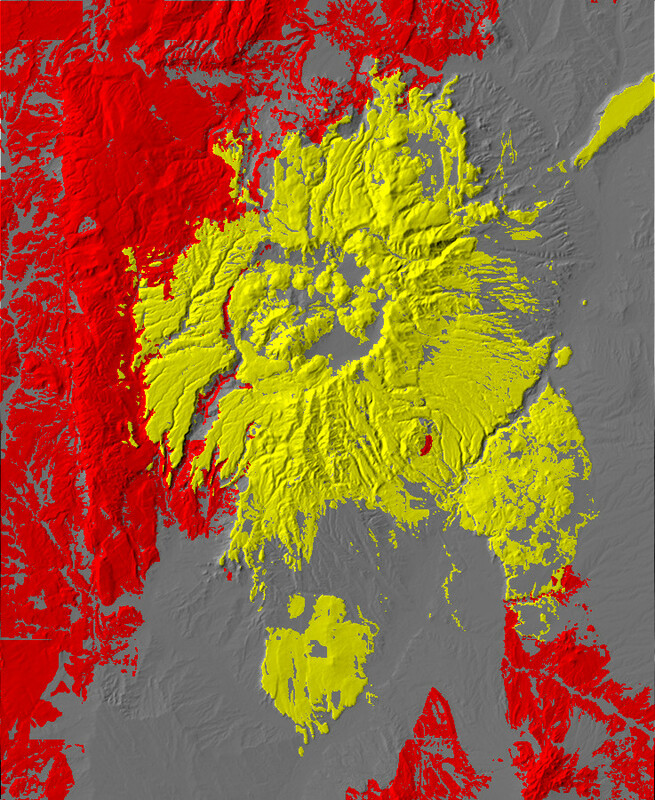 Compare the digital relief map below with the satellite photo shown earlier. This map covers an area of one square degree centered on the Jemez. This corresponds to a rectangle 111 km (69 miles) from north to south and 90 km (56 miles) from east to west. You will see variations on this map throughout the pages that follow, highlighting important features of the Jemez as they are discussed. Let's begin with this map, which illustrates the main tectonic provinces of the Jemez area. This map colors various rock exposures by age or type. The red areas are older rocks, which to the west correspond to the Colorado Plateau. The red areas in the southeast are geologically similar to the Colorado Plateau, but are separated by the Rio Grande Rift -- which coincides with the gray area extending from southwest to northeast. Yellow shows areas of young volcanic rock, corresponding to the Jemez volcanic field. Our story begins with the birth of the Earth itself. Some 4.55 billion years ago, somewhere in the outer arms of the Milky Way Galaxy, a dying star exploded. A shock wave of almost unimaginable power raced away from the center of the explosion, sweeping before it the extremely tenuous gas and dust of interstellar space. As the shock wave began to lose strength and break up, the matter it had swept up collided with a giant molecular cloud, one of many that line the spiral arms of galaxies like our own. The collision compressed and heated the cloud, but the abundant dust grains and simple molecules mingled with the gas of the cloud quickly radiated away the heat. The compressed cloud began to collapse under its own gravity. As the cloud collapsed, the denser pockets within it began to collapse even faster. These in turn broke up into yet small collapsing pockets. One such pocket began to rotate, slowly at first and then with increasing speed as it contracted. It became a thick disk rotating around a large central mass — the infant Sun. The young Sun was cooler but brighter than the Sun of today. It was also rapidly spinning. However, magnetic fields stirred up in its turbulent outer layers began to brake its rotation, transferring momentum to the thick disk around it. Thus prevented from collapsing into the Sun, this disk began to condense into the planets of the Solar System. The dust and gas making up this disk was very different in composition from the Earth of today. It was mostly hydrogen and helium mixed with with less than 2% of all the other chemical elements combined. These had been expelled from an earlier generation of dying stars, whose nuclear forges had fused the primordial hydrogen and helium into heavier elements. 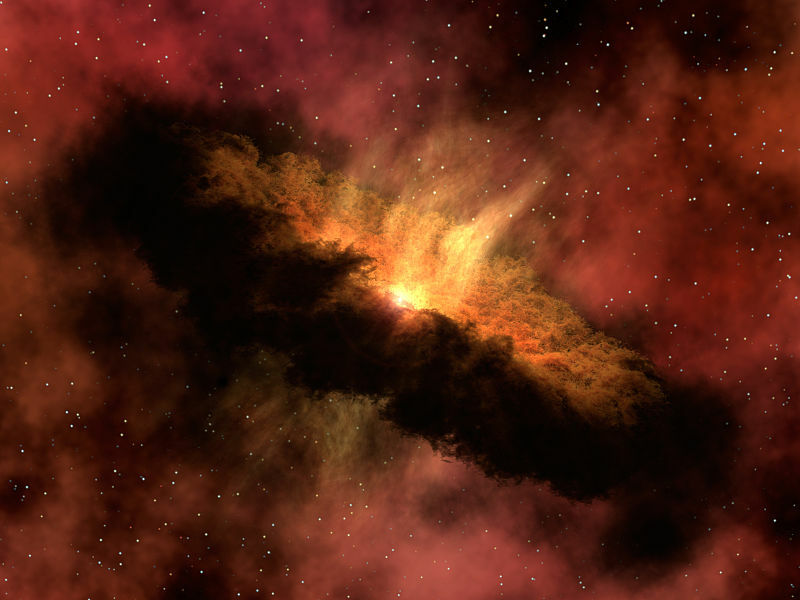 The exploding star that triggered the formation of the Solar System added a final dose of heavier elements, including radioactive elements whose fingerprints are found in meteorites. Of the elements heavier than helium, oxygen was the most abundant, followed by carbon, neon, iron, nitrogen, silicon, magnesium, and sulfur. Only oxygen, iron, silicon, and magnesium remain abundant in the Earth today. This reflects the chemistry of the different elements. The early Solar System was a violent place, blasted by intense radiation and violent shock waves from the restless young Sun. Only those elements that could take stable solid form were able to contribute to the formation of the Earth and the other inner planets. Helium and neon form no solid compounds, so they are found in the modern Earth in only the smallest traces. Hydrogen, carbon, and nitrogen formed gaseous molecules of water, carbon dioxide, and ammonia that became part of the Earth only as minor components of more stable solid minerals. Sulfur formed various sulfur oxides and metal sulfides; the oxides behaved like other gaseous compounds, while most of the metal sulfides found their way into the earth's core early in its history, leaving only much smaller quantities in the Earth's crust. By contrast, oxygen combined with iron, silicon, and magnesium to produce very stable solid minerals that now make up the bulk of the Earth. We have a good idea of the age of the Earth from several lines of evidence. One is the age of the Sun. Astronomers can calculate how long it would take for a star with the Sun's mass and composition to reach its present state, based on what we know about the rate at which it fuses hydrogen to helium. These calculations can be checked against helioseismic measurements, which look at how the entire Sun vibrates, to get clues about its interior state. The models can be further checked by comparison with nearby stars. These all give a reasonably consistent age for the Sun of about 4.5 billion years. If we assume that the Earth formed out of the same cloud of gas and dust as the Sun, then the Earth must be around 4.5 billion years old as well. Another way to estimate the age of the Earth is from the decay of radioactive isotopes. The atoms of a particular chemical element, such as oxygen or uranium, all contain the same number of protons in their nuclei (eight for oxygen, 92 for uranium), but the number of neutrons can vary. Thus, some oxygen nuclei contain nine or ten neutrons rather than the usual eight. Each of the possible number of neutrons in the atoms of a chemical element defines an isotope of the element, and we distinguish different isotopes by adding a prefix to the element symbol that gives the total number of neutrons and protons in the nucleus. Thus the most abundant isotope of oxygen is written as 16O, since its nuclei contain eight protons and eight neutrons. The nuclei of some isotopes are unstable and randomly decay to a different nucleus, either by emitting two protons and two neutrons combined into a helium nucleus (alpha decay) or by transforming a neutron to a proton by emitting an electron and an antineutrino (beta decay). Alpha decay is characteristic of very heavy nuclei, while beta decay is characteristic of nuclei that are overloaded with neutrons. For example, the most common isotope of uranium, 238U, is the heaviest isotope of any element found on Earth in any quantity. A nucleus of 238U is very slightly unstable, so that out of a large number of 238U nuclei, half will experience alpha decay over a period of 4.47 billion years. This period of time is known as the half-life of the isotope. When a 238U nucleus decays, it is transformed into a nucleus of an isotope of thorium, 234Th. This nucleus is badly overloaded with neutrons and rapidly beta decays, with a half-life of just over 24 days, to an isotope of protoactinium, 234Pa. This is even more unstable, and undergoes another beta decay with a half life of just over a minute to become 234U. And so on, down through a decay chain of unstable nuclei, none of which has a half life greater than a quarter of a million years, until a stable isotope of lead, 206Pb, is reached. We know the half life of 238U with high precision. We can also accurately measure the abundances of 238U and 206Pb in a rock sample using various kinds of mass spectrometers. If we know how much of these isotopes the rock started with, we can then calculate its age. A particularly good mineral for this purpose is zircon, ZrSiO4, which is present as small grains in many kinds of rock. When a grain of zircon forms, it readily incorporates traces of uranium into its structure, but not lead, which has the wrong chemical behavior. As a result, we can assume that almost all the lead we find in a zircon grain was produced by decay of the uranium it started with. If the amount of 238U is equal to the amount of 206Pb, then the age of the zircon grain must be equal to the half-life of 238U, 4.47 billion years. Younger grains will have a corresponding lower ratio of 206Pb to 238U, from which their ages may be calculated. Zircon is a highly durable mineral, being hard and chemically inert. The oldest zircon grains found on Earth, from the Jack Hills of western Australia, are about 4.40 billion years old. This only tells us that the Earth cannot be younger than this age, because the oldest zircon may have formed some time after the Earth formed. 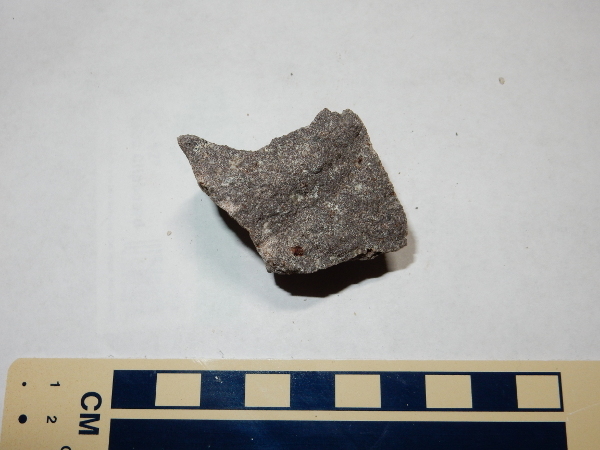 However, we can also measure the age of rocks brought back from the Moon by the Apollo astronauts, whose landing sites included some that were deliberately chosen by NASA for their apparent great age. The most accurate age measurements of all come from meteorites, some of which (known as carbonaceous chondrites) are virtually unchanged from the very beginning of the Solar System. It is from these meteorites that we get a precise age of 4.55 billion years for the Solar System and, presumably, the Earth. The actual process of formation of the Earth involved dust grains merging to form progressively larger bodies, called planetesimals, that merged through further collisions to form the planets. This process was mostly complete by 10 million years after the birth of the Solar System. The newborn Earth was extremely hot and molten. Most of the heat came from the violent impacts of the planetesimals that became part of the Earth. The rest came from the decay of radioactive material from the dying stars that contributed the heavier elements in the Earth's makeup. Much of the iron in the young Earth remained uncombined with oxygen. Being dense, this iron settled into the center of the Earth, taking with it most of the sulfur and heavy metals with which the Earth was born. This process took a few tens of millions of years. We know this through another clever line of reasoning based on isotope measurements. One of the isotopes of hafnium, 182Hf, decays to an isotope of tungsten, 182W, with a half-life of just nine million years. Tungsten dissolves readily in liquid iron, but hafnium does not. Thus, any 182W produced before the earth's core formed would have been carried into the core along with the iron, while any 182W produced after the core formed would remain in the Earth's outer layers. The amount of 182W relative to other isotopes of tungsten in terrestrial samples is higher than the ratio in meteorites, showing that the core formed before all the 182Hf could decay into tungsten. The same approach, but using the 235U - 207Pb isotope pair, gives an age for the core of about 80 million years after the birth of the solar system. This is significantly longer than the estimate of 30 million years from radioactive hafnium. The likely explanation is that the Earth collided with a Mars-sized object, which planetary scientists have named Theia, very early in its history. This also explains the origin of the Moon, which is thought to have formed from debris left orbiting the Earth after the collision. This colossal impact reset the uranium clock for core formation, but not the hafnium clock, which was already run down by that time. Another line of evidence is the abundance of chemical elements in the mantle compared with carbonaceous chondrite meteorites. Tungsten is not the only element that dissolves readily in molten iron. A number of other elements, which geologists classify as siderophiles, have a similar affinity for iron. Their pattern of depletion from the mantle, compared with meteorites, tells us that the iron core must have formed very early and under conditions of high pressure, most likely in the depths of an ocean of molten rock (which geologists call magma). Some planetary scientists believe that iron had already begun separating into cores in the planetesimals that merged to form the Earth. Thus, within about 30 million years, the Earth had a core of iron enriched with sulfur and heavy metals, surrounded by a mantle composed mostly of silica (silicon dioxide, SiO2) and metal oxides. It was at about this time that the early Earth was struck a glancing blow by Theia. 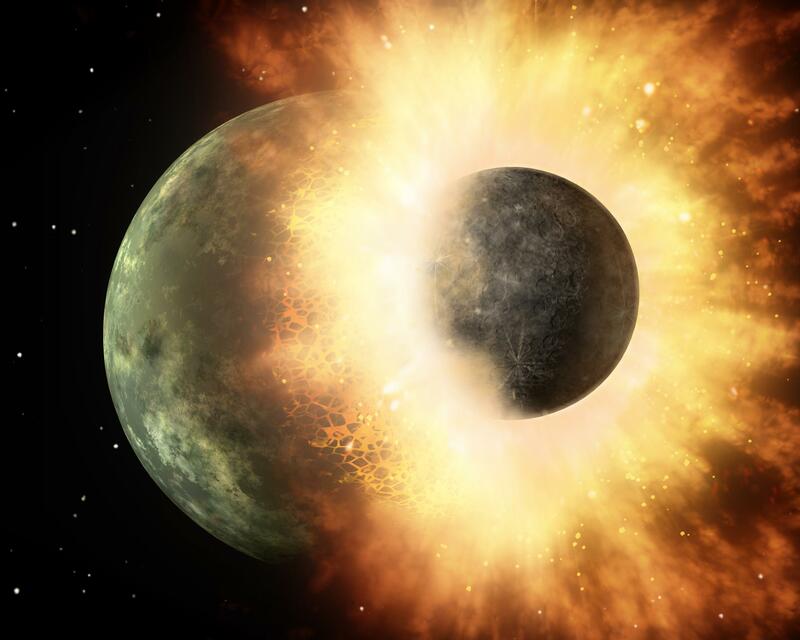 Most of the core of Theia became part of the Earth, explaining why the Earth has a relatively large iron core, while much of the mantle of Theia went into orbit around the Earth and eventually coalesced into the Moon, which is relatively poor in iron. The tremendous energy of the collision melted most of the Earth's mantle, turning it back into an ocean of magma. Large computer simulations of the impact suggest that parts of the magma ocean may have reached temperatures as high as 7000 K (12,600 F), briefly giving the Earth an atmosphere of vaporized rock. However, this would have cooled very quickly. As the Earth continued to cool, convection currents in its young mantle helped heat escape, and the mantle rapidly solidified, probably in less than 10 million years. Convection is still an important process in the Earth today. Almost all materials contract as they cool. (Water freezing to ice is a notable exception.) When a hot body of liquid is allowed to cool, its exposed surface cools first. The cooler surface liquid contracts and becomes denser than the hotter liquid beneath. This causes it to sink, and hotter material from beneath rises to take its place. This is the process of convection, and it is an important mechanism for transporting heat energy. In a viscous fluid, or in a fluid that is cooling very slowly, the rising and sinking currents tend to organize themselves into large cells, like those in the simulation shown above. Magma is fairly viscous, and the rate of cooling is very slow for a body as large as the Earth. Hence, convection within the Earth may generally be expected to organize itself into large convective cells. Like the core, the solid outer crust of the Earth formed very early in its history. Most likely a solid crust formed very shortly after the impact that created the Moon, but all traces of the earliest crust have been destroyed, either by later impact events, by erosion, or by other geologic processes. This early period of the Earth's history, from which no solid rock survives, has been named the Hadean Eon by geologists.The name alludes both to the hellish conditions that prevailed on the young Earth and to the hidden nature of this time period. 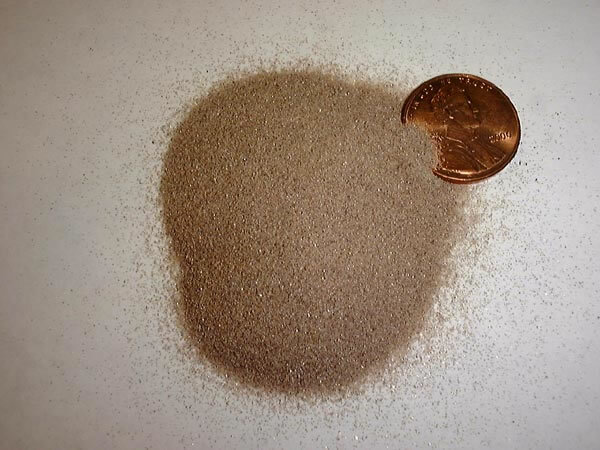 Individual zircon grains, eroded out of the rock in which they formed and redeposited in slightly less ancient sedimentary beds, are all that remain of this eon. During the Hadean, there was only the beginnings of continents, and there were frequent impacts by large bodies left over from the birth of the Solar System. This included a Late Heavy Bombardment around 4 billion years ago, which was possibly caused by migration of the outer planets to their current stable orbits. This planetary migration would have perturbed the orbits of numerous asteroids and brought them into collision course with the inner planets. The Hadean was followed by the Archean Eon, the first from which we have samples of solid rock. 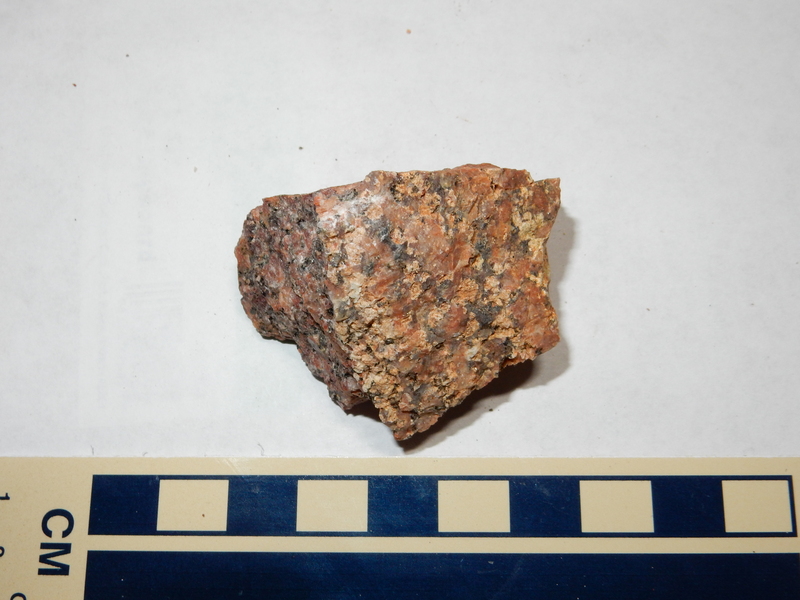 The oldest known whole rock, found at the Acasta River in the Northwest Territories of Canada, is about 4.055 billion years old, and geologist have placed the end of the Hadean Eon near this point in time. Geologists are reasonably certain that there was liquid water on the Earth's surface by 3.8 billion years ago. This is the age of the oldest known example of a banded iron formation, at Isua, Greenland. Banded iron formation is a kind of rock consisting of thin, alternating layers of silica and iron oxides, and it forms by chemical precipitation in liquid water. However, the oldest oceans may have been closer to 4.2 billion years old, based on oxygen isotope ratios in the oldest zircon grains. The ratio of 18O to 16O increases in rock that reacts chemically with ocean water, because the slightly lighter and more mobile water molecules containing 16O are more likely to evaporate from ocean water or, when ocean water reacts with rock, to remain in solution. When the 18O-enriched rock is recycled to magma in the lower crust and this magma forms new zircons, the zircons also show the enhanced 18O. The 18O/16O ratio in zircon grains increased significantly at around 4.2 billion years ago, and some geologists interpret this as the time the first large oceans formed. These oceans would have been very different from the oceans of today. They formed under an atmosphere containing practically no free oxygen but thick with carbon dioxide. The acidic ocean water would have rapidly leached sodium and other soluble ions out of the crust to become saline. Limestone and other carbonate rock of Archean age is quite uncommon, because it would have tended to dissolve in acidic ocean water. At the beginning of the Archean, the earth's crust was almost entirely what we would now classify as oceanic crust, whether or not it was all covered with oceans. To understand what this means, we need to jump ahead of our story and look at the structure of the Earth as it is today. This will be a long digression, but it will lay the groundwork for much of the rest of this book. The iron core and silicate mantle were initially molten. The core has since partially solidified, starting at its center, to produce a solid inner core. The outer core is still liquid, and the slow motion of the convective currents in the outer core are what generates the Earth's magnetic field. The mantle is almost completely solid. However, there is a layer in the upper mantle, the asthenosphere, which contains scattered pockets of magma. Even in these pockets, the magma is a small percentage of the total volume, filling pore space in otherwise solid rock. The asthenosphere begins about 80 km (50 miles) below the surface, but has no well-defined lower boundary. Different geologists estimate the thickness of the asthenosphere as anywhere from 110 km (70 miles) to several hundred kilometers. Because the asthenosphere is close to its melting point, it is a zone of weakness. This gives it its name: Greek asthenḗs = 'weak'. This peculiar distribution of liquid regions in the Earth is the result of the competition between increasing temperature and increasing pressure as one goes deeper into the earth. Rock under the enormous pressure found deep in the Earth melts at a higher temperature that it would at the surface. In the crust and outermost mantle, the increase in pressure with depth is enough to keep the rock from melting in spite of the increase in temperature. Only in the asthenosphere does the temperature get just enough ahead of the pressure for the rock to partially melt. Further down, pressure gets ahead again, and the rest of the mantle is solid rock. At the boundary of the outer core, there is an abrupt change in composition from iron and magnesium silicates with a very high melting point to nickel- and sulfur-enriched metallic iron with a somewhat lower melting point. This is enough for the iron to remain molten. Deeper in the core, the pressure again catches up with temperature, and the inner core is solid. In spite of being mostly solid rock, the mantle is still experiencing very slow convection. This is possible because the hot rock is ductile. If you hit a piece of lead with a hammer, the lead tends to deform under the force of the blow rather than shatter. The same is true of many other metals. Even iron will deform under force if it is heated to a high temperature, a property that is used to advantage both by traditional blacksmiths and in modern steel mills. At the Earth's surface, silicate minerals shatter rather than deform, but at the high pressure and temperature in the Earth's interior, silicates become ductile. 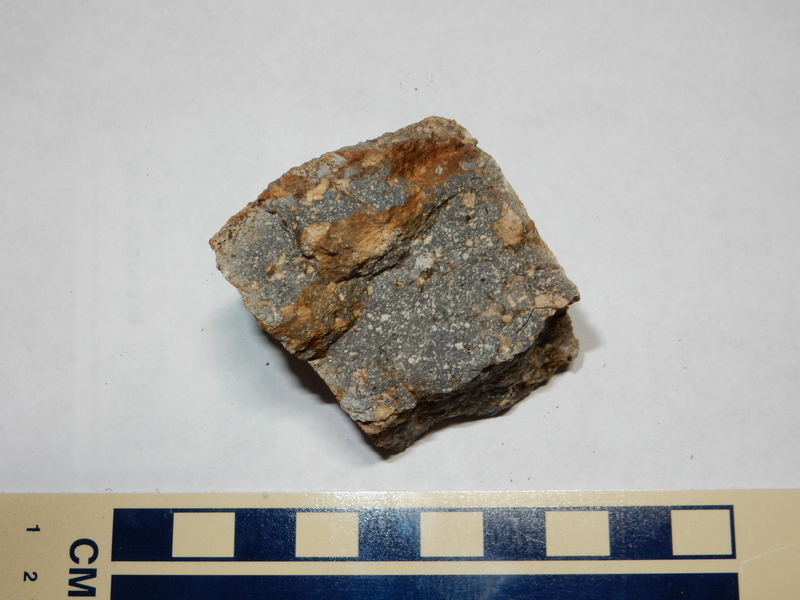 This ductile rock is able to flow very slowly, over geologic time scales, at rates of a few centimeters a year. 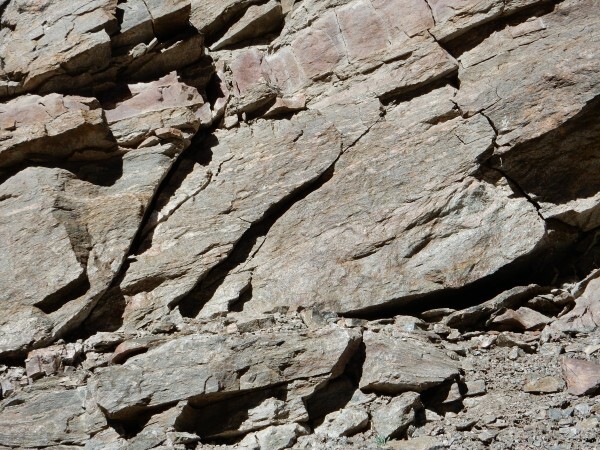 The depth at which brittle rock becomes ductile is known as the brittle-ductile transition, and this is normally about 13 to 18 km (8 to 11 miles) down. However, the transition can vary locally, as is proven by the existence of very deep earthquakes in certain geographical locations, such as Tonga. Earthquakes take place only in rock that is still brittle. The earth's outermost layer, the crust, is not uniform. Geologists confirmed this when they began making systematic seismic observations in the late 19th century. An earthquake takes place when brittle rock under stress suddenly breaks. This disturbance sends elastic waves through the surrounding rock, which can be detected at great distances with sensitive seismographs. These waves move at a velocity that is determined by the nature of the rock they travel through as well as the nature of the wave itself. The fastest waves are P waves, or pressure waves, which are similar to sound waves. A P wave is a zone of compression that moves through the material. P waves are capable of passing through almost any kind of material, including liquids and gases, and so they are observed passing through every part of the Earth's interior. An S wave, or shear wave, is a zone of shear, in which the material is displaced to one side and then snaps back. Think of snapping a stretched spring to one side, causing a kink to travel down the spring. S waves propagate only through solid materials, and they propagate more slowly than P waves. A skilled seismologist can estimate how far away an earthquake took place by comparing the arrival times of P waves and S waves. There are also various kinds of surface waves, none of which penetrate deeply into the earth and all of which travel more slowly than either P or S waves. P waves travel more quickly through less compressible materials. As one goes deeper into the earth, the rock is under greater pressure, which means that it is already highly compressed and strongly resists further compression. Thus, the velocity of P waves tends to increase smoothly with depth. However, seismologists have found that there are certain depths at which the velocity changes more abruptly. These are called seismic discontinuities. These discontinuities are interpreted as depths at which the nature of the rock changes. Such changes can be the result of a change in chemical composition, such as the change from silicates to iron at the core-mantle boundary, or they can be the result of a phase change in the rock, in which the composition is the same but the rock changes from one crystal structure to another that is more stable at the higher pressure. The first seismic discontinuity to be identified was discovered by the Croatian seismologist Andrija Mohorovičić in 1909. He found that seismic wave velocities increased sharply a few kilometers beneath the surface. The Mohorovičić discontinuity (which most geologists refer to as the Moho or simply as the crust-mantle boundary) is now used to define the boundary between the upper mantle and the crust. It is believed to be the maximum depth at which a mineral called feldspar is an important component of the rock. As geologists mapped the Moho, they found that the thickness of the crust was much greater under the continents than in the ocean basins. This was not surprising. Geologists had already concluded from theoretical principles that mountain ranges must be held up by low-density roots, just as the tip of an iceberg is held above the surface of the ocean by the buoyancy of the rest of the iceberg lying beneath the ocean's surface. The existence of these mountain roots was confirmed by British surveyors in India in the mid-19th century, who discovered that their plumb bobs pointed slightly away from the Himalayas. The low-density roots of the mountains distorted the Earth's gravitational field. Geologists now routinely perform gravimetric measurements using extremely sensitive gravimeters to get clues about what lies underground. It is striking how different continental crust is from oceanic crust, and how abrupt the transition from one to the other is. Continental crust forms almost all the dry land on Earth, plus the continental shelves, which are the areas of relatively shallow water around the margins of the continents. Some distance offshore, the continental shelves begin to slope steeply downwards to the deep ocean floor, which is composed of oceanic crust. Oceanic crust is thin (less than 10 km or 6 miles thick) and dense (about 3.0 g/cm3) compared with continental crust, which is 25 to 65 km (16 to 40 miles) thick with a density of about 2.7 g/cm3. Both types of crust are enriched in silica, highly enriched in aluminum, sodium, potassium, and calcium, and depleted in magnesium compared with the underlying mantle, which has a density of about 3.4 g/cm3. However, oceanic crust is less enriched with these elements than continental crust. The difference between oceanic and continental crust reflects different origins and has important implications. Most geologists look inside the earth for the ultimate driving force of diastrophism; no known exterior forces are sufficiently versatile to account for the variety of deformation we see. From what we have been able to learn so far, it would seem that plastic creep, perhaps in the upper part of the mantle, is the active element, and the brittle crust on which we live is passively riding on this very slow flow. The final chapter of Shelton's popular Geology Illustrated is still worth reading today. It captures the moment in history when geology was poised on the brink of a revolution -- the acceptance of the theory of plate tectonics. As early as 1850, the great American oceanographer, Matthew Fontaine Maury, suspected the existence of a underwater mountain range in the central Atlantic. Tantalizing evidence for such a range was uncovered by HMS Challenger during its famous 1872 expedition, but it was not until the 1950s that a team of oceanographers from Columbia University, led by Marie Harp and Bruce Heezen, fully mapped the great underwater mountain chain running from north to south through the center of the Atlantic Ocean. Other researchers found that this chain, dubbed the Mid-Atlantic Ridge, continued through the Indian Ocean and the far southern Pacific Ocean before turning north as the East Pacific Rise and continuing to the west coast of North America. This mid-ocean ridge has a deep valley along most of its crest, where there is volcanic activity and frequent earthquakes. The ridges were a mystery until the 1960s, when geologist Harry Hess of Princeton University suggested that the ridges were spreading centers where new oceanic crust was formed that then moved away from crest of the ridges. This was confirmed by studies of the magnetization of the rocks on either side of the ridge. The Earth's magnetic field abruptly flips its polarity every half million years or so, and solidifying magma is left with a magnetic field matching that of the Earth at the time it cools. This allowed the ocean crust near the ridges to be dated. Geologists found that the rock is very young close to the central valley and grows progressively older further away, in either direction. The implications were clear: The central valley of the mid-ocean ridge is a rift valley where the crust is being pulled apart, and volcanic activity creates new crust to fill the resulting gap. The discovery of the age progression around mid-ocean ridges marked a turning point in the acceptance of the theory of plate tectonics. According to this theory, the mantle is in slow convective motion. Hot, ductile mantle rock continually creeps upwards beneath the mid-ocean ridge. As the rock approaches the surface, the decrease in pressure allows it to partially melt. The magma so produced erupts along the rift valley of the mid-ocean ridge to form new oceanic crust, which then moves away from the ridge. The crust forms the upper portion of the lithosphere, which is the rigid outer shell of the earth. The uppermost layer of the mantle forms the lower portion of the lithosphere. Beneath the lithosphere is the ductile asthenosphere. The lithosphere is broken into large plates that are displaced by the convection currents in the underlying mantle. A single plate may include both oceanic and continental crust. 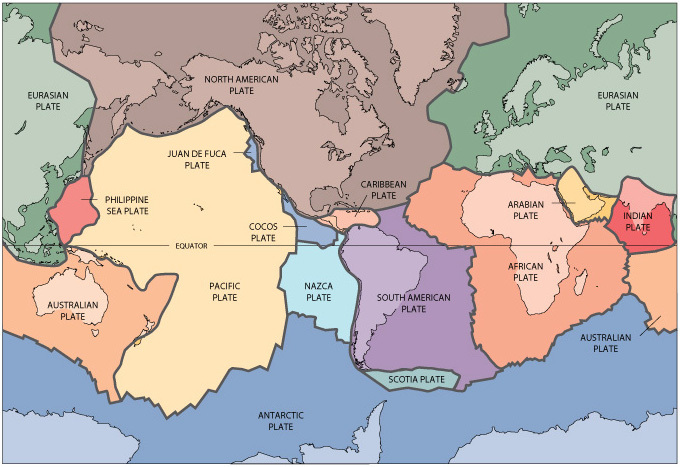 For example, the North American plate includes much of the floor of the western North Atlantic Ocean as well as the continent of North America. The distinction between oceanic and continental lithosphere is crucial to the behavior of plates. A region of lithosphere surfaced with light, thick continental crust is too buoyant to sink into the mantle. As a result, continental lithosphere may be torn in half (rifted) or merged with another block of continental lithosphere (sutured) but it is almost never pulled into the mantle and destroyed. On the other hand, a region of lithosphere surfaced with thin, heavier oceanic crust is nearly as dense as the underlying asthenosphere. When it is freshly formed and still hot, oceanic lithosphere is buoyant enough to resist sinking into the mantle, but as it slowly cools and contracts, it reaches a point where it is no longer buoyant. What goes up must come down, and the convective flow of hot mantle rock upwards beneath mid-ocean ridges must be matched by a downward flow of cold mantle rock somewhere else. In the modern earth, this takes place where plates collide. When cold oceanic lithosphere meets buoyant continental lithosphere, two things can happen. If the oceanic and continental lithosphere are able to move together as a single plate, like the continental and oceanic portions of the North American Plate, then the continental margin is described as a passive margin. The continental shelf ends in a continental slope that drops smoothly to the ocean floor. There is little seismic or volcanic activity along a passive margin. On the other hand, if the continental and oceanic lithosphere are driven together, the thick, light continental lithosphere rides up on the thinner and heavier oceanic lithosphere. The oceanic lithosphere is driven downwards, and because it lacks buoyancy, it begins to sink into the mantle. This process is called subduction. 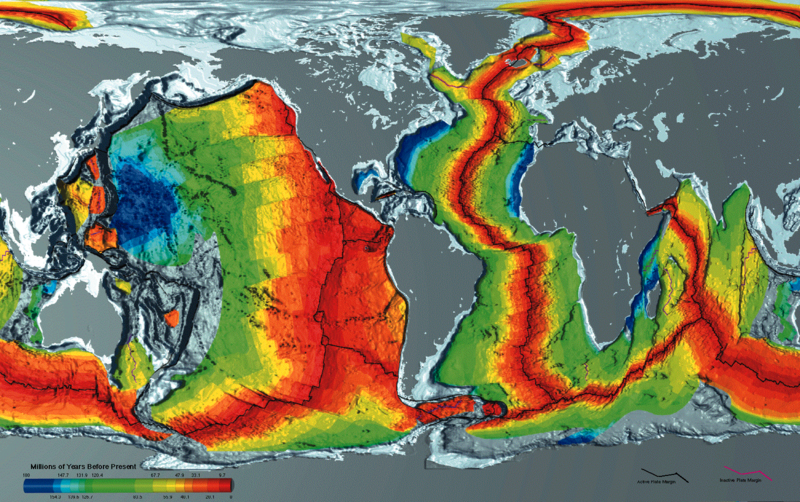 The point where the oceanic lithosphere begins to sink into the mantle is marked by a deep oceanic trench, and ocean floor maps show such trenches along many continental margins. In particular, subduction is taking place along most of the continental margins of the Pacific Ocean and south of Indonesia in the Indian Ocean. These are described as destructive margins, and how! The oceanic lithosphere does not go gentle into that good night. The motion of oceanic lithosphere under continental lithosphere produces the most powerful earthquakes known, as the plates periodically lock together, stress builds, and then the plates break loose over an area that can extend for hundreds of kilometers. The damage is compounded by tsunamis produced by the sudden movement of the ocean floor next to the trench. Historical examples of such megathrust earthquakes include the great Chilean earthquake of 1960, the most powerful ever recorded; the Alaskan "Good Friday" earthquake of 1964; the Indonesian "Boxing Day" earthquake of 2004, which produced a tsunami that killed a quarter of a million people; and the Japanese Tohoku earthquake of 2011, which produced a tsunami that killed 15,894 people and wrecked the nuclear power station at Fukushima, after topping tsunami barriers 14m (45 feet) high. Plot of earthquakes along the Wadati-Benioff zone of the Kurile Islands. USGS. The descending slab remains relatively cold and brittle for some time. Such slabs are responsible for the deepest earthquakes, which occur at depths of up to 600 km (370 miles). In 1949, seismologist Hugo Benioff noted that the focuses of earthquakes in the Tonga area of the South Pacific and on the western margin of South America were located on planes dipping at an angle of about 45 degrees into the earth. 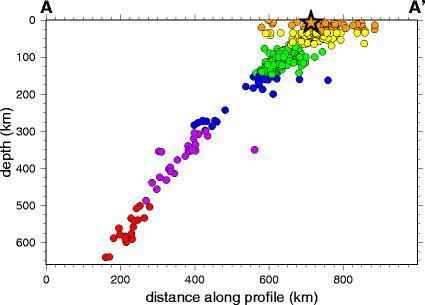 Japanese seismologist Wadati Kiyoo made the same observation at about the same time, and these zones of deep earthquakes, corresponding to subducting lithosphere, are now known as Wadati-Benioff zones. The existence of these zones was important evidence supporting the theory of plate tectonics. What is the force that drives the subducting plate into the subduction zone? Most likely it is the weight of the subducting plate itself. This produces slab pull that acts all the way back to the mid-ocean ridge. 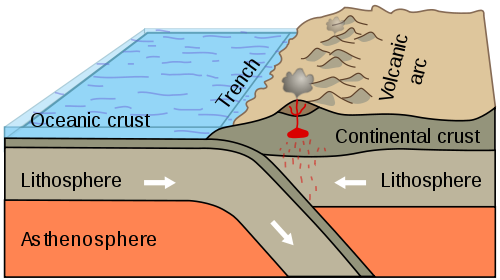 The asthenosphere on either side of the subducting plate is also pulled down with it, like the suction produced by a sinking ship, and this suction helps draw the overriding plate over the subduction zone. Thus oceanic crust is constantly being created and destroyed, as it moves like a conveyor belt from its birth at mid-ocean ridges to its death at destructive margins. No oceanic crust on Earth has an age greater than about 270 million years, which is a mere 6% of the age of the Earth. On the other hand, some portions of the continents are as old as 4 billion years, or 88% of the age of the earth, because continental crust does not subduct. The picture we get from plate tectonics is of ancient continents that are continually jostled around by the movement of young oceanic crust, which in turn is driven by mantle convection. Subduction must have worked differently before there was any continental crust. We have no geologic evidence for how subduction worked in the Hadean, though some planetary scientists have suggested it resembled the hot spot volcanism now seen on one of Jupiter's moons, Io. However, by the beginning of the Archean Eon, subduction resembled what we see today in oceanic island arcs. Examples of such arcs can be found in the western Pacific and southern Atlantic. Here the subducting oceanic lithosphere is being overridden by a different oceanic lithosphere plate, rather than a continental lithosphere plate. Destructive margins usually have a line of volcanoes (a volcanic arc) along the overriding side of the trench. The oceanic crust descending into the mantle contains a great deal of water, and this boils off when the subducting slab is heated at depth. Above the slab, on the overriding side, there is a mantle wedge into which the water rises. Water lowers the melting point of silicate minerals, and the higher the silica content, the greater the decrease in the melting point. 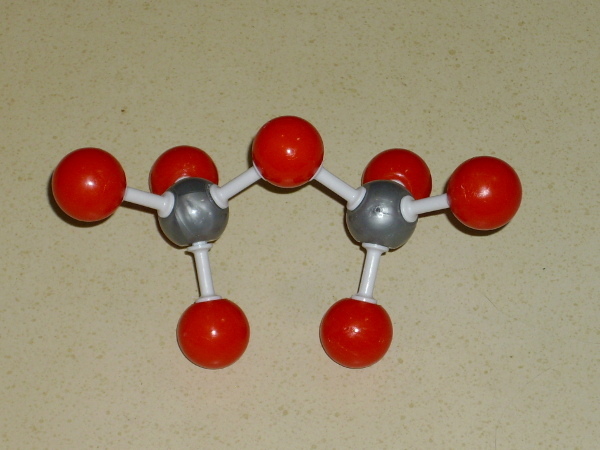 This is because water attacks the chemical bonds in silica. When a liquid solidifies, its atoms usually arrange themselves into regular lattices called crystals. This minimizes the chemical energy of the substance, by allowing each atom to chemically bond with as many other atoms as possible. (Chemical bonding lowers the energy of a group of atoms, which is the foundation of the science of chemistry.) How many bonds are possible is determined by the size of each atom, and by the arrangement of its electrons around its nucleus, which is determined by the rules of quantum mechanics. The specifics are different for each chemical element, and each stable arrangement of atoms into crystals is called a mineral. For example, the most common kind of crystal that forms from pure silica is the mineral, quartz. Silicon atoms bond quite strongly to oxygen, and each silicon atom can bond to four oxygen atoms. 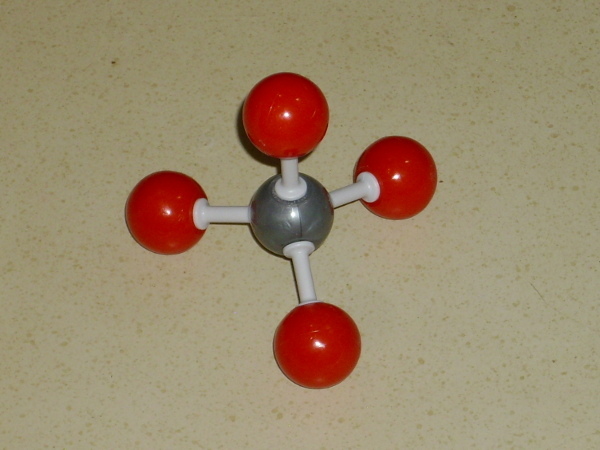 Model of an isolated silica tetrahedon. Silicon is grey and oxygen is red. The atom sizes are reduced to better show the bonds. Each oxygen atom, in turn, can bond to two silicon atoms. In minerals like quartz, the structure can be thought of as an arrangement of tetrahedra, each with a silicon atom at its center:and with each tetrahedron joined to a neighboring tetrahedron at each of its corners through a shared oxygen atom. This produces a strong three-dimensional network of interlocked silica tetrahedra, and so it is unsurprising that quartz is the hardest abundant mineral. This breaks down the silica network and thereby lowers the melting point of the silica. The consequence of this is that, whenever a wet slab of crust sinks into the mantle, the water that boils out of the subducting slab and rises towards the surface causes partial melting of the overlying mantle wedge. This leads to the creation of new continental crust. The key is that the melting is partial. Mantle rock consists of a mixture of different minerals, all with different melting points. Such a mixture of different minerals begins melting at a lower temperature than any of the pure minerals alone. This is similar to the way that salt sprinkled on ice lowers its melting point. The temperature at which a mixture of minerals first begins to melt is called the solidus, since below this temperature the mixture is completely solid, while above this temperature the mixture is partially melted. The magma produced at the solidus has a very well-defined composition, called the eutectic. This is the composition that minimizes the chemical energy of the magma plus solid minerals. The rock will continue to produce magma of this eutectic composition as heat is added, until one of the solid minerals that contributes to the eutectic is fully melted. The melting process will then shift towards a new eutectic at a higher temperature determined by the remaining solid minerals. But the process almost never reaches the point where all the solid minerals have melted, because there is very rarely enough heat available to fully melt the rock. Typically less than 30% of a mantle source rock will be melted before the supply of heat energy is exhausted. Because the eutectic can (and usually does) have a different composition than the solid source rock from which it came, the effect of partial melting is to produce magma with a composition different from the source rock, whose own composition is also changed by the extraction of the magma. The process of partial melting is thought to explain a kind of rock known as a migmatite. The Santa Cruz River leaves the little valley of Cundiyo via a gorge cut through solid Proterozoic rock. Here there is a small pullout and a trail up the gorge, popular with both locals and visitors to the area, that allows the geologic tourist to view the ancient rock. This rock was once subject to heavy deformation at great depth underground, and some of the rock was transformed into a migmatite. 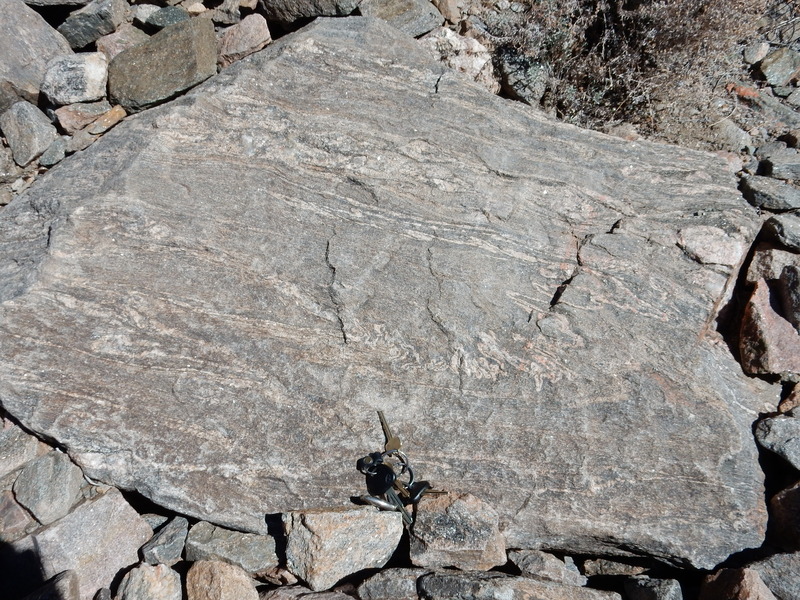 A typical migmatite is composed of darker rock (the melanosome) with ribbons of lighter rock (the leucosome.) Many geologists interpret a migmatite as rock that was brought to the melting point, with the leucosome representing the liquid magma separating from the residual solid melanosome. 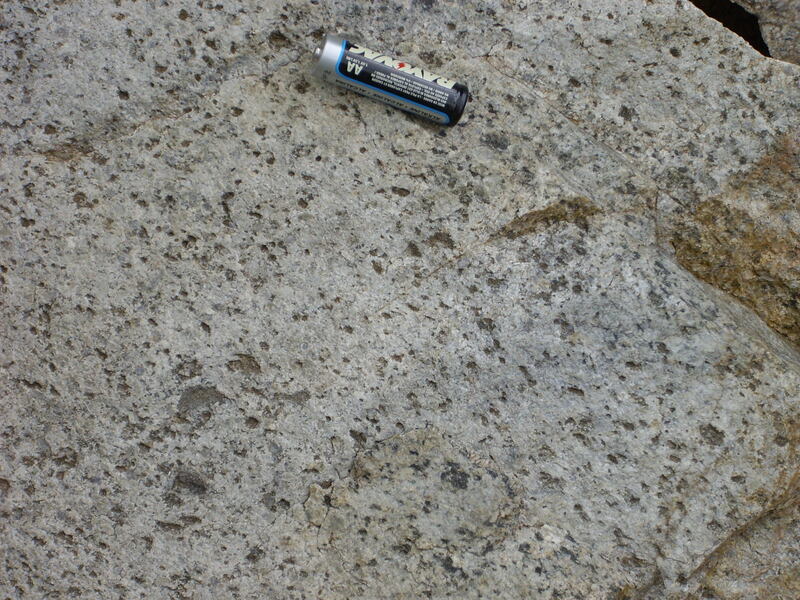 Many migmatites are located on the boundaries of large granite bodies, which tends to support this interpretation, although it’s possible the leucosome infiltrated the melanosome rather than being extracted from it. When typical dry mantle rock is partially melted, the magma produced has a composition of about 50% silica, versus 40% for the source rock. Magnesium is very reluctant to enter the eutectic, so the magma contains perhaps 16% magnesium oxide versus about 50% for the source rock. Calcium and aluminum are enriched about fourfold in the magma, while the alkaline metals, sodium and potassium, are greatly enriched, by a factor of 10 to 30. 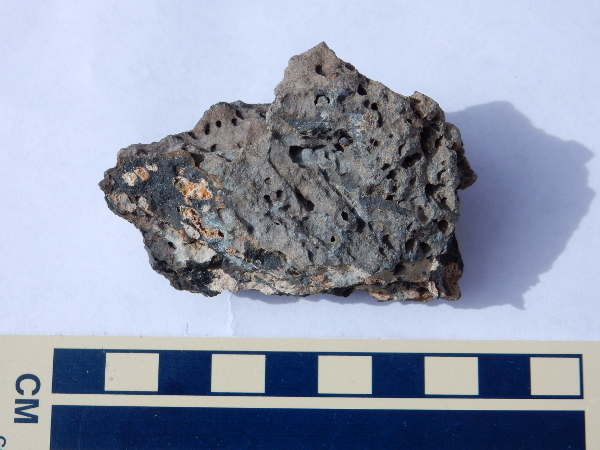 This magma has roughly the same composition as the common volcanic rock, basalt. The remaining solid mantle rock is depleted in the elements that are enriched in the magma. 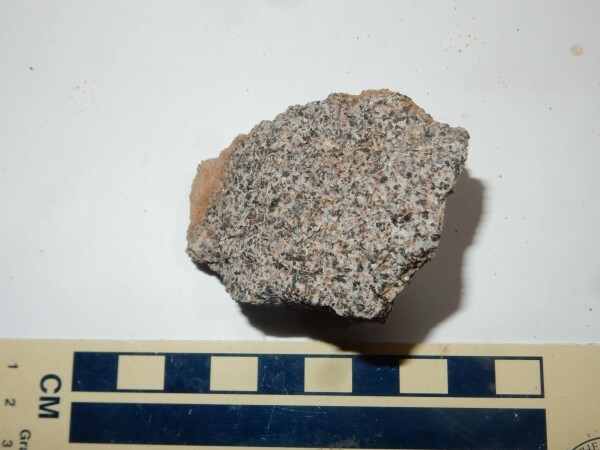 Geologists believe that a rare type of rock sometimes found as inclusions in lava flows, called harzburgite, is depleted mantle rock carried to the surface by the magma. Mantle rock with a high water content, such as the mantle wedge above a subduction zone, melts to produce a more silica-rich magma, about 57% to 63% by weight. If this magma erupts to the surface, it will harden into a characteristic kind of rock called andesite. Andesite is poorer in calcium and magnesium as well as somewhat richer in silica than basalt. 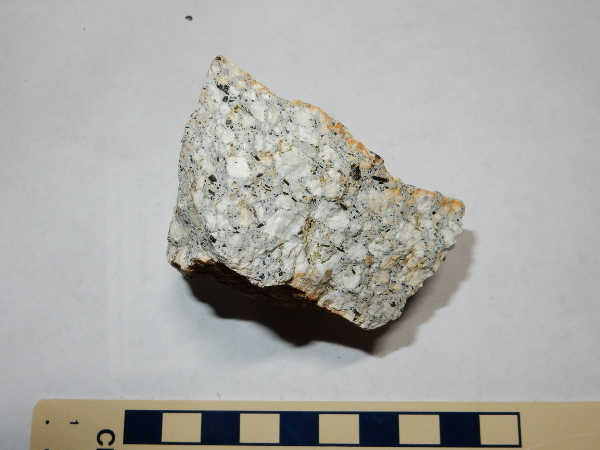 Whereas basalt is usually a fairly uniform dark rock, andesite typically contains large individual crystals (phenocrysts) of the minerals plagioclase feldspar and hornblende. Magma produced in the mantle is lower in density than the source rock, so its buoyancy drives it towards the surface, where it solidifies into rock that is lower in density than the mantle from which it came. Most of the oceanic crust of the Earth is composed of basalt. Basalt is nevertheless relatively dense for a crustal rock, and when lithosphere surfaced with basalt cools sufficiently, it is capable of sinking back into the mantle by subduction. Continental crust is composed of rock with an average composition close to that of of andesite. However, the composition of the crust is not uniform. The lower crust resembles basalt while the upper crust is, on average, richer in silica than andesite. It follows that the formation of continental crust must involve some further process that increases the silica content of the original (primitive) basalt or andesite magma. This process is magma differentiation. As magma rises towards the surface, it begins to lose heat to the cooler solid rock that surrounds it (the country rock). As it cools, it begins to crystallize. Just as source rock does not melt all at once, and the partial melt is different in composition from the original source rock, so magma does not usually solidify all at once. There is a temperature (the liquidus) at which the magma first begins to crystallize, and the first crystals that form usually do not have the same composition as the magma. Instead, the first crystals that form have whatever composition drives the remaining magma towards its eutectic. This is similar to the melting process, but in reverse. In fact, if the magma had never left its source region, the crystallization process would be precisely the melting process in reverse. It is not precisely the same because the magma has left behind the most refractory (highest-melting) components of the source rock and is now in a cooler, lower-pressure environment. The process of crystallization of a magma was first studied by the Canadian scientist, Norman Bowen, at the Carnegie Institution of Washington in the early 1900s. Bowen melted various rock powders and observed which minerals formed first when these artificial magmas were slowly cooled. He found that there were two distinct series of minerals that crystallized out of a cooling magma. Bowen's discontinuous reaction series was a sequence of minerals that crystallized one at a time, but there was also a continuous reaction series of increasingly calcium-poor and sodium-rich plagioclase feldspar. All these minerals will be important players in our story, and will be properly introduced in due course. The discontinuous series removes magnesium rapidly and iron more slowly from the magma, leaving a liquid that is increasingly enriched in silica, aluminum, and the alkaline metals. The continuous series, in turn, removes calcium from the magma. Minerals such as olivine and pyroxene are denser than magma. Given enough time, crystals of these minerals will slowly settle out of the magma. 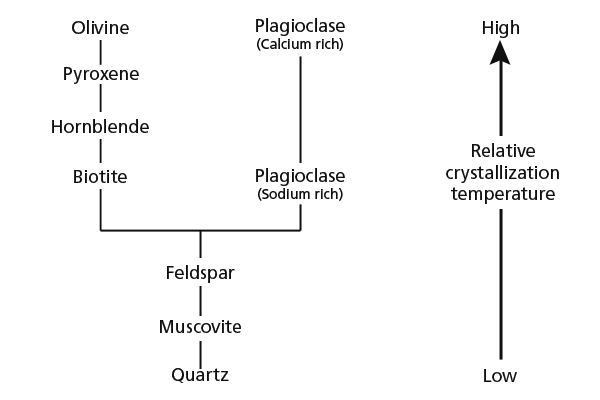 Plagioclase is not as dense as these minerals and often remains suspended in the magma, or even floats to the top of a particularly dense magma body. As a result, when basalt magma begins to crystallize, it loses magnesium, iron, and calcium, becomes more enriched in silica, and often contains suspended crystals of plagioclase. Its composition becomes that of andesite, which can be distinguished from andesite formed directly from wet mantle rock only through sophisticated geochemical testing. For example, plagioclase has a strong affinity for the lanthanide metal, europium, and magma from which significant amounts of plagioclase has been removed shows a highly characteristic depletion of europium relative to other lanthanide metals. Magnetite likewise has a strong affinity for vanadium, and magma from which magnetite has crystallized out is typically depleted in vanadium. The process of magma differentiation can continue beyond andesite to produce increasingly silica-rich magma. Magma with a silica content of 63% to around 70% produces a rock called dacite. Magma whose silica content has reached 70% or more forms a rock called rhyolite. You may have observed that, as the rock becomes increasingly rich in silica, it also becomes lighter in color. This is because magma differentiation removes iron from the magma as it enriches it in silica. This is a useful rule of thumb rather than a rigid rule; some dacites and rhyolites can be quite dark in color. However, almost all basalts are quite dark in color, and most rhyolites are light colored. The intrusive counterpart of andesite is called diorite. Diorite from the Abajo Mountains. Diorite is rare in the Jemez. The intrusive counterpart of dacite is called granodiorite. The intrusive counterpart of rhyolite is called granite. Igneous rocks low in silica are described as mafic, a word which was coined to reflect the high MAgnesium and Ferrous oxide content of these rocks. 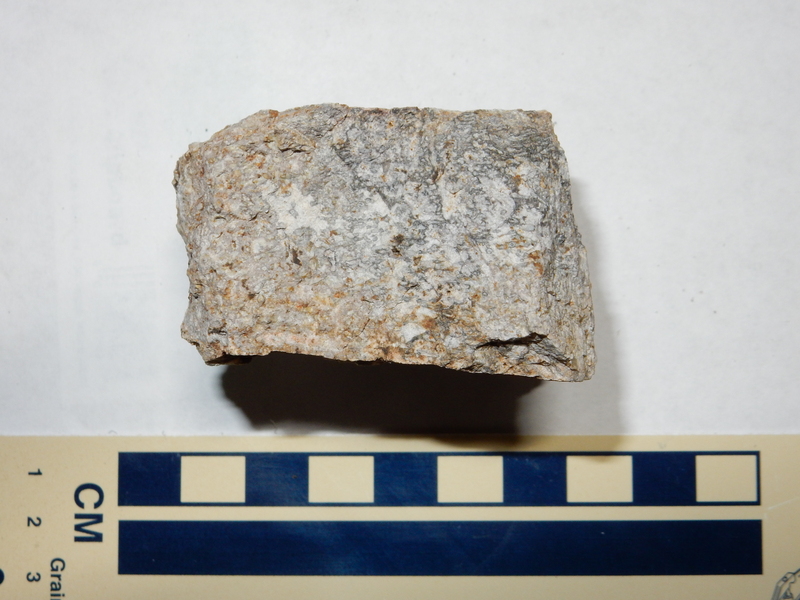 Likewise, the word felsic was coined to reflect the high content of FELdspar and SIlica minerals (such as quartz) in high-silica igneous rocks. Andesite is described as an intermediate rock. There are many further refinements to this simple igneous rock classification scheme. For example, rocks midway between basalt and andesite are described as basaltic andesites, and rocks midway between dacite and rhyolite are described as rhyodacites. And since silica is only one component of igneous rock (albeit the most important) there are further classifications based on the abundances of the other oxides in the rock, particularly the alkaline metals, sodium and potassium. Rather than bog our story down further with a discussion, say, of the distinction between tholeiitic and alkalic basalt, or of the finer points of distinguishing a rhyodacite from a quartz latite, I'll introduce these terms (if necessary) when I show pictures or samples of particularly well-characterized rock formations. If you are really interested, the full classification scheme is found in the appendix. A magma composed of pure silica would be extremely viscous, because the silicon and oxygen atoms keep trying to arrange themselves into silica tetraheda even in the liquid state. This produces localized chains and clumps of tetrahedra that impede flow. Metal atoms break up these chains and clumps and allow the melt to flow more freely, so low-silica mafic magmas are much less viscous than high-silica felsic magmas. Basaltic magma has about the viscosity of ketchup and flows relatively freely. Andesitic magma has enough silica to be about as viscous as smooth peanut butter, and so it flows significantly less freely. Dacitic magma is more viscous still (with a viscosity similar to Silly Putty) while rhyolitic magma has great difficulty flowing at all. Subduction in oceanic island arcs produces a great deal of andesite, and this was likely the nucleus of the first continents. Further subduction produced increasingly large quantities of dacite and rhyolite and their intrusive counterparts, as the thickening crust meant that the magma took longer to reach the surface and had more time to differentiate. 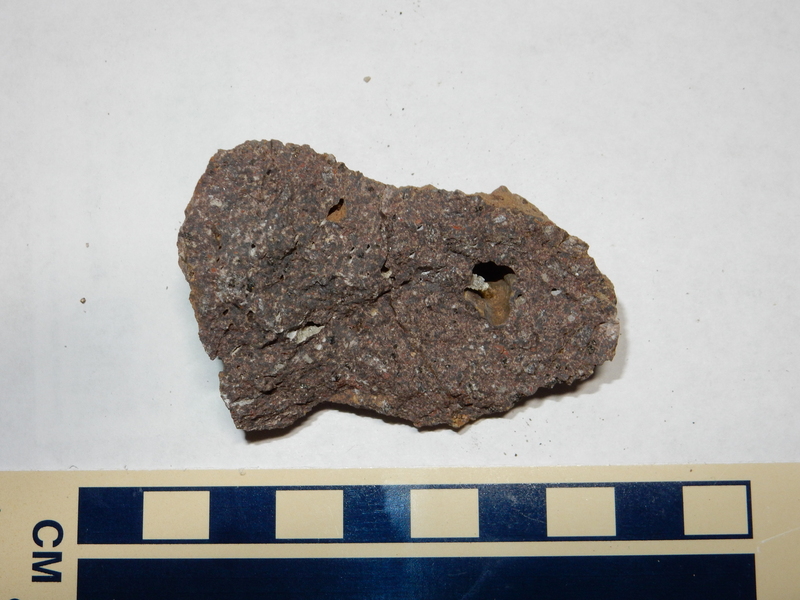 In some cases, primitive basalt magma never penetrated the crust at all, underplating the crust instead. The hot basaltic magma at the base of the crust heated the rocks above, causing them to melt and rise to the surface as silica-rich magma. The net effect was to concentrate the iron and magnesium at the base of the crust, where it sometimes delaminated or came loose and sank back into the mantle. The crust became increasingly thick, rich in silica, and low in density. It became continental crust. The continental crust of the Archean is quite distinctive. It consists of large bodies of high-silica rock crossed by belts of low-silica rock known as greenstone belts. The high-silica rock has a distinctive range of compositions, from tonalite through trondheimite to granodiorite (TTG). 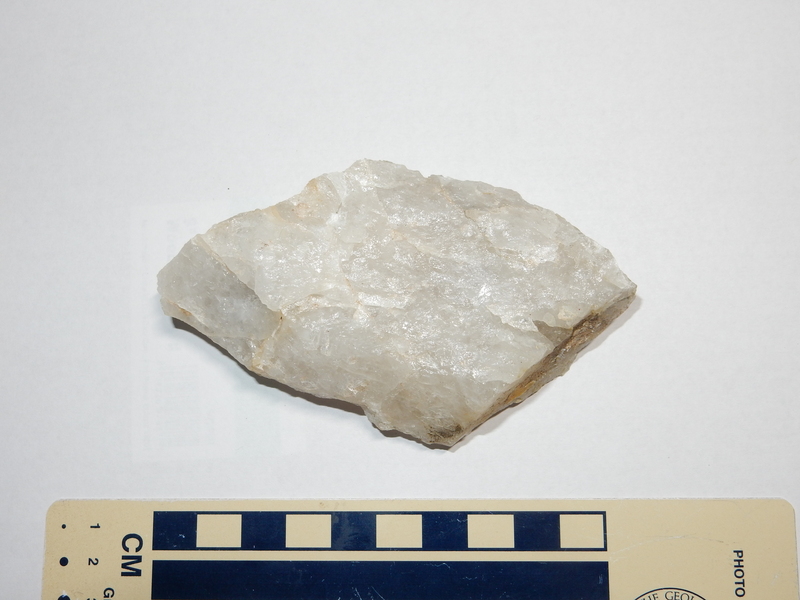 The TTG rocks are composed mostly of quartz and high-sodium plagioclase feldspar. The rock is deficient in potassium relative to younger crust, and may have formed from melting of a subducting slab at a relatively shallow depth due to the higher mantle temperature of the Archean. The greenstone belts are mostly metamorphosed basalt and sediments, and likely are traces of island arcs caught between bits of continental crust as they assembled into larger continents. 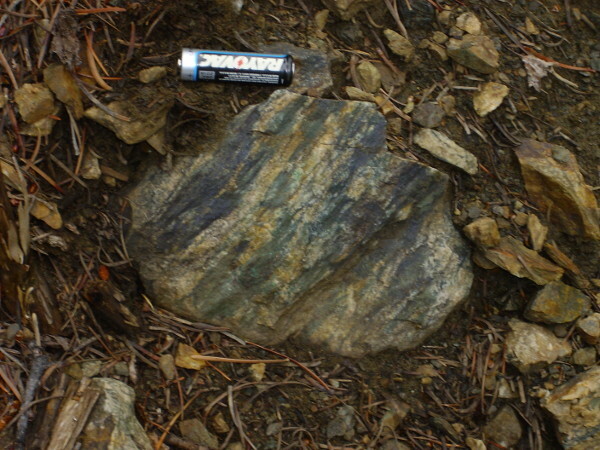 Some of the oldest greenstone belts contain an unusual very low-silica rock called komatiite,that is extraordinarily rich in magnesium and may have formed from a high degree of melting of young, hot mantle rock. There is evidence that the bulk of the Earth's continental crust formed by 2.5 billion years ago, which geologists have chosen as the end of the Archean Eon. Once again, the evidence is provided by radioisotopes. The rare earth element, neodymium, is slightly more likely to enter the partial melt that produces crust than is samarium, and so the decay of 147Sm to 143Nd tracks the formation of crust. Decay of 87Rb to 87Sr works in a similar way, with rubidium being far more likely to enter a partial melt than strontium. Both isotope ratios suggest that formation of continental crust had peaked by about 2.5 billion years ago. Additional evidence is provided by zircon grains in old sedimentary beds. When these are dated by radiometric means, they show a great spread in age reflecting the times of crystallization of the various source rocks for the sediments. There is a very pronounced peak in the numbers of zircons with an age of about 2.7 billion years, suggesting a great pulse of granitic magmatism, likely associated with the formation of continents, at about this time. As the mantle continued to cool, subducting slabs no longer became hot enough to melt directly. Subduction transitioned to the pattern of the post-Archean world, in which it is not the slab that melts to produce magma, but the mantle above the slab into which water vapor rises as the slab is heated at depth. Formation of the TTG continental crust of the Archean was replaced by the formation of crust more typical of the modern world. You may have noticed that I haven't mentioned the Jemez Mountains in my story so far. This is because New Mexico did not exist until 1.8 billion years ago. In the next chapter, I'll tell the story of how New Mexico first came to be. Copyright ©2014 Kent G. Budge. All rights reserved.